National Archives Citizen Archivist Program: Calling all Genealogy Volunteers! The National Archives Citizen Archivist program is recruiting help to tag, transcribe, and comment on records in the U.S. National Archives catalog. This is a great way for genealogy volunteers to help others discover their family history in the National Archives and learn for themselves what’s there. Have you heard? The U.S. National Archives is looking for Citizen Archivists! What is a Citizen Archivist, you ask? A Citizen Archivist is a virtual volunteer that helps the U.S. National Archives increase the online access to their historical records. This is done by crowdsourcing metadata about their records through tagging, transcribing, and adding comments to the U.S. National Archives catalog. As a Citizen Archivist, you will be volunteering your time to make historical and genealogical records more accessible to the general researching public to help them with their research. This could include genealogists, historians, writers, and other researchers that will benefit from your volunteer work. And who knows, maybe you will find records that belong to your ancestors! 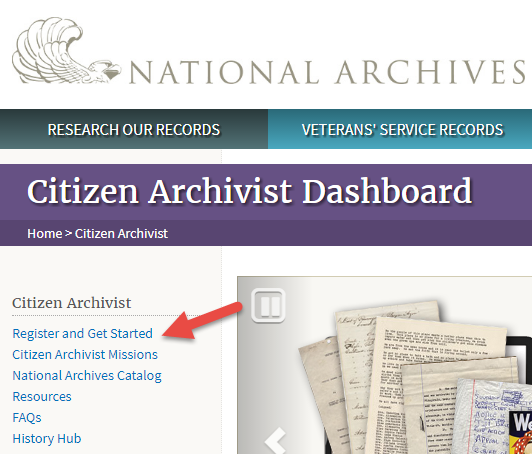 First, you will need to go to the “Citizen Archivist Dashboard” at the U.S. National Archives website. Once there, you will need to register to be a Citizen Archivist (see the screenshot on the right for where to click). Registration is free but you do need this account to be able to contribute to the project. Once you are registered and logged in, you can then navigate to the catalog and choose records from the curated missions. The “missions” are groups of records that need transcribing or tagging to help the records be more accessible to researchers working online. Some of the missions that are needing transcribing are “Fugitive Slave Case Files,” “Native American Reservations,” and “The Truman-Churchill Telegrams,” just to name a few. New missions are added to the site regularly, so be sure to check back often to see what is new that you would like to work on. Who Can Contribute as a Citizen Archivist? So, if you have some time on your hands and want to help make historical and genealogical records more accessible online, why not become a Citizen Archivist today? Click here to get started–or click below to read more ideas about how to give back to the genealogy community.